Snow Leopards are quite beautiful with their snowy, soft fur. Their name "leopard" easily describes the pattern on their fur and "snow" instantly reveals the color. Although, most of them do have a touch of off-white, tan or yellow highlighting in their coat. As you can see, the gorgeous Snow Leopard that allowed me to photograph him has that yellow highlighting in his face and chest area. His back and sides are white with a hint of grey. That fabulous coat is actually responsible for this big cats demise. 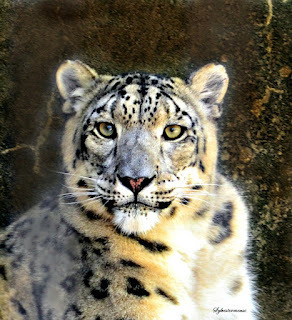 Mortal vanity and the desire to "wear" his coat often costs his life when a snow leopard encounters a human. 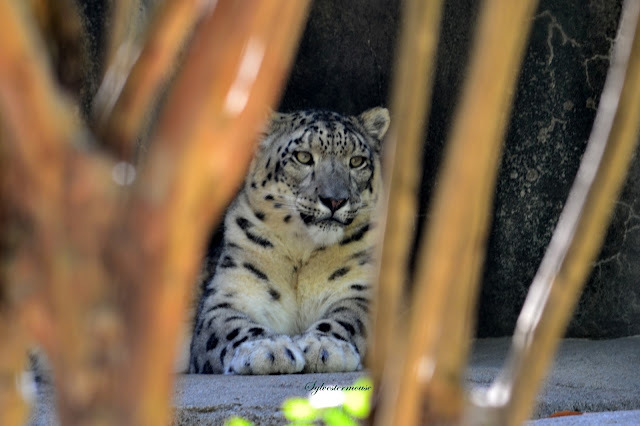 In the wild, you will only find the a Snow Leopard in the Himalayan Mountains of Central Asia. 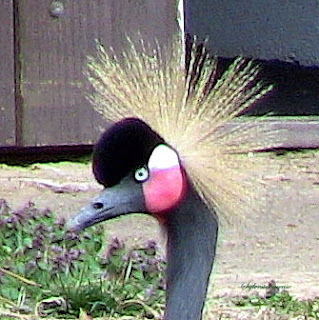 Most likely, our best chance to see one is in an accredited zoo. There are approximately 250 in American zoos and 600 in zoos worldwide. Estimates for how many Snow Leopards are still living in the wild, vary drastically. But, it would be safe to say that there are less than 8000. Unfortunately, their decreasing numbers make their coats even more valuable. However, it is illegal to own or sell a Snow Leopard coat. Personally, I always wonder why anyone would want the real fur when faux furs are just as beautiful, just as warm, a lot less expensive and a life is not lost to feed a vanity. How absolutely beautiful these creatures are! I'd much rather have a snow leopard in photos, stored in my memory from seeing one (as you have done), or as part of a stuffed animal collection rather than owning a coat that came from the animal itself. I just can't imagine exploiting these beautiful cats that way. Interesting facts here and gorgeous photos. Thanks! 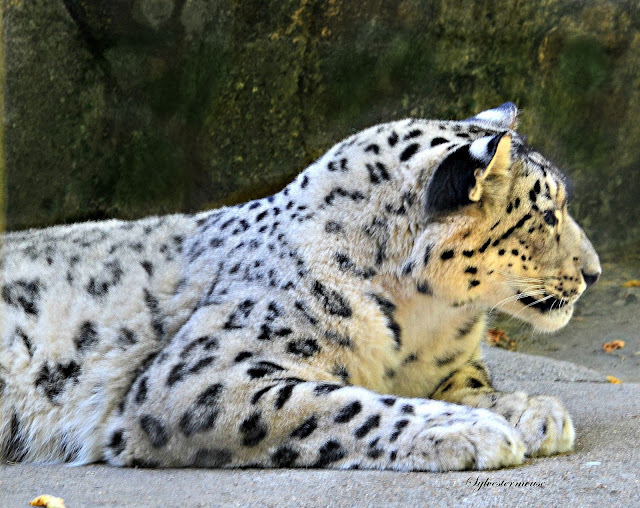 Love your beautiful photos of this snow leopard. I agree with Susan - can't imagine why anyone would want to wear a coat that comes from destroying this gorgeous animal. Thanks for sharing and making us aware of this endangered species.